Great pathway once again, Katrina. I was missing one step though: monitoring / testing in production. 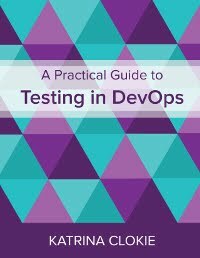 A lot of the work in this area end up sharing the testing activities to stuff we do before we release, and then to stuff we do when we have released. The concepts such as A/B testing, releasing to a percentage of users, finding out "the metric" that will tell you things have gone wrong badly and general ways to see what your users actually do would seem to be things that this pathway should include. Excellent point. I'll do a bit more research tomorrow and see if I can add another step. Thanks.